The benefits of sensory play for kids are aplenty. However, many parents and educators are opposed to using food for sensory play. 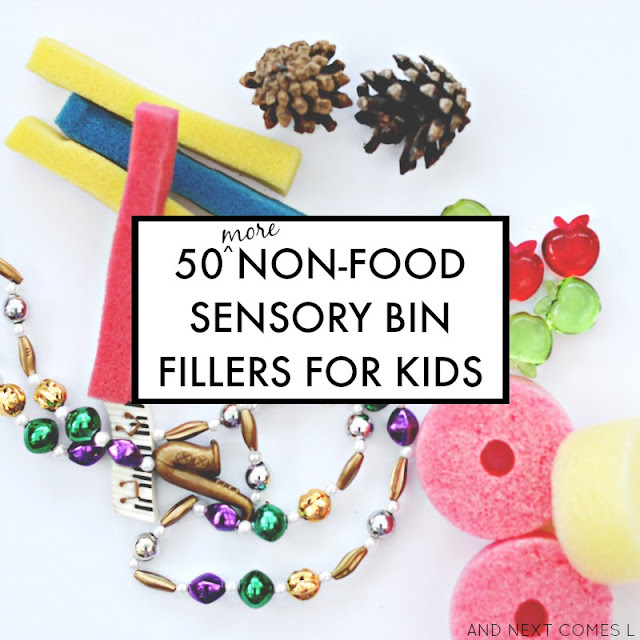 That's why I have already compiled a thorough list of 50 non-food sensory bin fillers to try with kids, but I simply couldn't stop there. There's even more options to consider! So here are 50 MORE non-food sensory bin fillers for kids. Again, I've included a free printable list for your reference. So from sponges to pool noodles to lotion, this list of sensory materials is going to have you reconsidering using food for sensory play. Or at least it will have you thinking outside the (sensory) box. Sponges are a great sensory bin filler because they come in a variety of shapes, sizes, colors, and textures. Either cut them up into little blocks or shapes or try shaped sponges like these alphabet sponges. Soft and fluffy, baby powder would make a great, although messy, sensory bin filler. Fabric based sensory bins are great for babies or small toddlers, so try using lace instead. These are fun to stretch, pull, twist, throw, and more. You can usually find them in the dollar store. Wood chips are an interesting hard, rough texture for little hands to explore. They work great for any kind of forest, farm, or construction type sensory bin. Another great rough texture for kids to play and explore with. Bark is lovely paired with moss in a sensory bin. Who doesn't have lots of broken crayons kicking around the house? Well, try them as a sensory bin filler. I remember silly string being so much fun as kid so I think it would be a lot of fun as a sensory bin filler. Slime would make a great sensory bin filler for any kind of oozy swamp or sewer like sensory bin. Ninja Turtles small world with slime is the first thing that comes to my mind! Kids loooooove bubble wrap. Okay, adults love popping the stuff too, so why not try it as a sensory bin filler. It's a great way to recycle and work on fine motor skills. One of my favorite sensory bin fillers to use is acrylic vase fillers. They come in a variety of shapes, sizes, and textures and there is always seasonal themed fillers in Michaels and dollar stores during holiday seasons. The easiest way to encourage literacy through sensory play is to create a sensory bin using plastic alphabet magnets or beads as the base. Recycle those lids and add them to your sensory stash! Try writing sight words or letters or math equations on the lids to sneak in some extra learning. The fuzzy texture of pipe cleaners is great for a sensory bin filler, but kids will also love exploring the magnetic properties of the pipe cleaners as they play. Another great natural material to use in sensory bins is pinecones. They have such an interesting texture! You can easily whip up a sparkly, crinkly sensory bin using gift bows. They work great for Christmas or birthday themed sensory bin fillers. 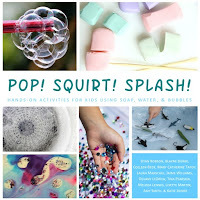 Squishy and cool, water balloons are a fun sensory bin filler for kids. You can also write sight words, math equations, letters, etc. on the balloons to sneaky in some extra learning. You can find all sorts of foam shapes, letters, or numbers. They also come in a variety of sizes, colors, and textures, making them an awesome sensory bin filler. Add some water for some extra fun! Try bingo chips in a sensory bin! 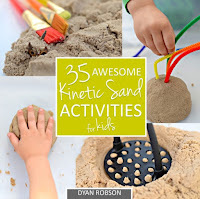 They can be a lot of fun for kids to try and scoop up, especially in water. You can usually buy a bag of makeup sponges at the dollar store, making them a pretty frugal sensory bin filler. Raid your dress up bin for some costume jewelry and try it as a sensory bin filler. Natural materials always make a great sensory bin filler because they're usually plentiful and are always free. Moss would be wonderful for a rainforest sensory bin or a fairy small world, for example. The smooth, creamy texture of lotion, paired with a scent and/or color, can make for a lovely, but messy, sensory bin filler. I love the smell of sawdust! It also feels like no other texture. You can find all sorts of mini erasers, especially at the dollar store. Grab some seasonal ones to make quick and easy holiday themed sensory bins. Stock up on some dollar store toothpaste and let the kids explore the texture. Kids will love to help squeeze the toothpaste out of the tube and into the sensory bin. Try some colorful modeling clay, air dry clay, or try some more natural clay as a sensory bin filler. It's a great way to encourage fine motor skills, stamping, print making, and more! Silly putty is a lot of fun to play with and kids will love it as part of a sensory bin. Paper clips are a great sensory bin filler for exploring magnetic properties and working on fine motor skills (by linking the clips together). A perfect first sensory bin filler for babies would be those plastic baby links. They come in a variety of colors and textures. Try cutting up some pool noodles and filling a sensory bin with them. Sneak in some literacy learning by writing some sight words or letters on the pool noodles. Either the flower kind or the ruffled kind would work great in a sensory bin. Perhaps you have some old puzzles that are missing some pieces? Well, upcycle them into a sensory bin filler. Confetti is another fun sensory bin item. It is one that I could foresee my children throwing everywhere though, so be prepared! Look no further than your kitchen for an easy sensory bin filler. Those pot scrubbers have such a unique texture! Crumble up some tin foil and fill up a sensory bin with them. Or wrap up some objects in tin foil and let the kids work on fine motor skills as they unwrap the little "presents." The smooth, cool texture of round marbles is appealing to a lot of kids. The kids will love seeing them roll around in a sensory bin. I hoard cardboard tubes like crazy. I never ever do anything with them it seems, but they would be awesome in a sensory bin! Want a little sparkle? A little glam? Some glitz? Try sequins or large glitter as a sensory bin filler. Plastic eggs are not just for Easter (at least in my mind). Fill up a plastic bin with them and let the kids have fun opening and closing them. Try using either liquid paint or paint powder as a sensory bin filler. Styrofoam balls come in a variety of sizes and would make a great filler for winter themed sensory bins. Fill a bin with glow in the dark stars, turn off the lights, and let the kids' eyes lead the way. Put those dandelions to good use! Fill up a bin and let the kids play. Grate up some chalk and let the kids get messy (and dusty!) with chalk dust. My kids love googly eyes so I'm positive they would love a googly eyes sensory bin. Grab a variety of sizes and colors for some extra silliness. Whip up a bath of clean mud for your next sensory bin! Floam is crazy fun because of those little foam balls. What will you pair with floam? Try using reusable plastic ice cubes, either chilled or unchilled, for your next sensory bin filler. Kids will love stacking and sorting them. They also come in a variety of shapes and sizes, like these fruit ones. We have never used any of those pouch cap products, but I know a lot of families do. And, as a result, I know they have collected a lot of lids over time. Put them to good use in a sensory bin! 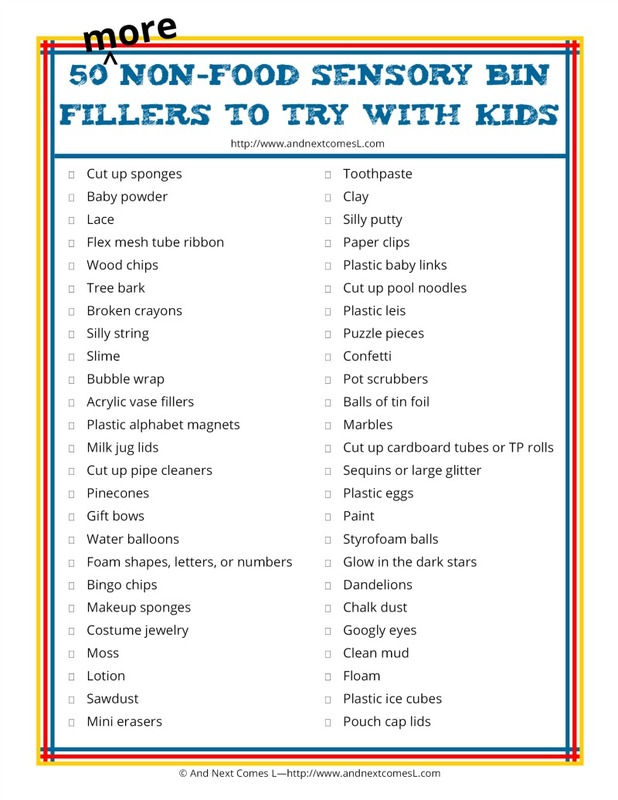 Want the Free Printable List of Non-Food Sensory Bin Fillers? For even more suggestions, check out these amazing books that focus on using non-food items for sensory play! Or check out the original 50 non-food sensory bin filler printable list!